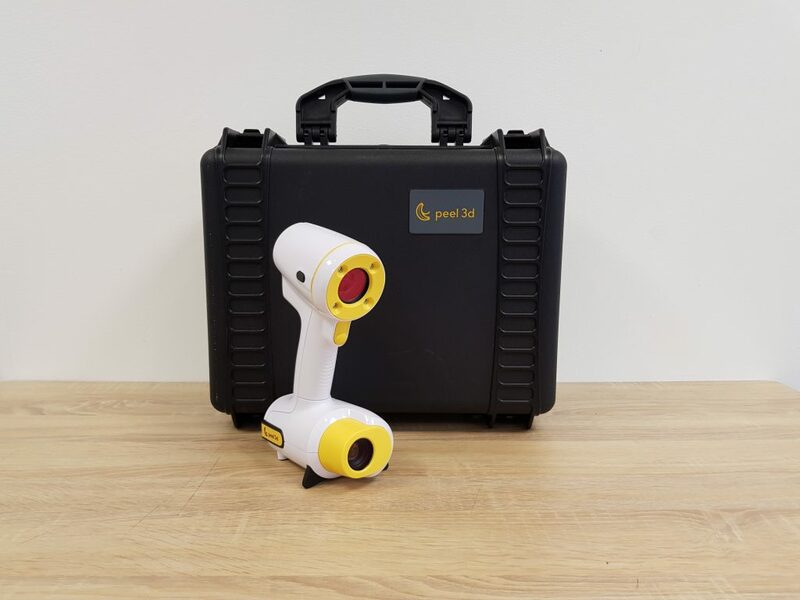 Launched October 2017, peel 3d is a sub-$6,000 handheld 3D scanner powered by Canadian scanning provider Creaform and American global electronics manufacturer AMETEK. Boasting professional-grade quality at a competitive price tag, the device is targeted at customers simple, effective and more affordable 3D object capturing. As such, the peel 3d is designed to scan well without the need for sticky or external targeting points. It also uses white LED structured light technology, which is safe if exposed to the naked eye. First impressions of the peel 3d is that it is lightweight, facilitating long scanning session, and its calibration is fast and simple. As with other 3D scanners of this price range, the peel 3d is calibrated using a board designed with multiple dots. In this instance, the scanner is place closed to the board and slowly moved away until a notification is received. In peel 3d this calibration process takes about a minute to complete. Unlike other scanners in its range, the process is only conducted once with the dot-board flat on the ground/a table. Other scanners often require movement and slanting of the board to complete calibration. Further, for this process to be fully automated, you would be looking at a 3D scanner at around three times the price, so peel 3d’s solution is a welcome feature. The software used for post processing 3D scans is also intuitive and simple to pick up. Six objects, with varying surfaces and complexities, were 3D scanned using the peel 3d for the purpose of this review. All were performed in an office environment, with adequate overhead lighting. Most of the object were 3D scanned twice to find the optimal settings for each object. Parameters for each test 3D scan can be found in the table below.